Further to my earlier post about Rick Mofina which can be found here, my interview with Rick can be found on the Shots website here. Comic Crime writer Christopher Brookmyre has been shortlisted for the Bollinger Everyman Wodehouse prize. Christopher Brookmyre is a previous winner of this award. He won it in 2006 with his novel All Fun and Games Until Someone Loses an Eye. This year the nominated book is A Snowball in Hell. See here for further information. According to the Sunday Times, the former partner of the best selling author Stieg Laarson is currently locked in battle with the family over the crime writer's fortune. See here for further information. Radio 4 is going to be having a Le Carre-fest as it starts to dramatise all of John Le Carré's eight Smiley novels on the radio. Radio 4 will begin the dramastisation on Radio 4 on Saturday (23 May) with the Call of the Dead. The other books that are due to be dramatised will be A Murder of Quality, The Spy who came in from the Cold The Looking Glass War, Tinker, Tailor, Soldier, Spy, The Honourable Schoolboy, Smiley's People and the Secret Pilgrim. See here for further information. 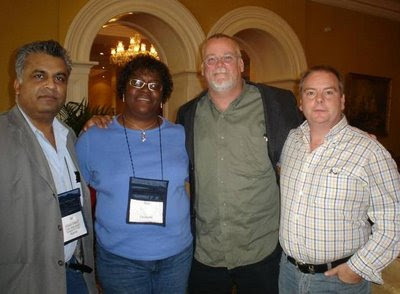 Bouchercon 2009 Anthony Award nominations! Registered attendees will vote during Indianapolis Bouchercon where the winners will be announced during a gala awards ceremony on Saturday, October 17, 2009. Huge congratulations to all the nominees. Mike Stotter and I would like to thank Ayo for her hard work blogging here, during Crimefest in Bristol. So what’s THE SCARECROW all about? Jack McEvoy is at the end of the line as a crime reporter. Forced to take a buy-out from the Los Angeles Times as the newspaper grapples with dwindling revenues, he's got only a few days left on the job. His last assignment? Training his replacement, a low-cost reporter just out of journalism school. But Jack has other plans for his exit. He is going to go out with a bang — a final story that will win the newspaper journalism's highest honor — a Pulitzer prize. Jack focuses on Alonzo Winslow, a 16-year-old drug dealer from the projects who has confessed to police that he brutally raped and strangled one of his crack clients. Jack convinces Alonzo's mother to cooperate with his investigation into the possibility of her son's innocence. But she has fallen for the oldest reporter's trick in the book. Jack's real intention is to use his access to report and write a story that explains how societal dysfunction and neglect created a 16-year-old killer. The Poet crossed his path years before. He reunites with FBI Agent Rachel Walling to go after a killer who has worked completely below police and FBI radar—and with perfect knowledge of any move against him. What Jack doesn't know is that his investigation has inadvertently set off a digital tripwire. The killer knows Jack is coming—and he's ready. Shots would like Gaby Young of Orion Publishing for arranging time with Mike Connelly as we all had a great time [and laughed a great deal]. Incidentally Mike Connelly is a Guest of Honour at Bouchercon Indianapolis – so book now and see you in the bar. Sadly, this is my last post about Crimefest! I did manage to go to my room just after 3:00am this morning (Sunday 17 May) and finally got to bed at 4:00am. Even Ali left before me and he was then followed by Mike sometime afterwards. My day of course started once again with me joining Zoe Sharp and Andy for breakfast. Breakfast with the two of them is always such good fun and I hope that I get the opportunity to do so again. I wasn't surprised that I didn't manage to get to some of the panels on Sunday morning, it wasn't that I was suffering for a hangover it was more that I was too lethargic to do anything quickly. I did however help out very briefly on the registration desk again. Being at the desk is a strategic post and enables one to see and speak to a vast number of people as they are bustling around the corridors as they leave one panel and then go to another or as they stop at the "mini" bookshop. Meg Gardiner - 6 points. Rather sadly neither Mike Stotter nor I could stay until the end as we had to make tracks back to London. I do however know what the results were courtesy of course of Ali Karim. The winner was Martin Edwards, (whilst I had predicted Martin Edwards to win, I believe that I was way out on how many points that he scored) followed by David Stuart Davis, Simon Brett and then Meg Gardiner. The person who managed to accurately predict the winner and points were being given as a prize a full pass to next year's conference. Mike Stotter came second. He predicted that Martin Edwards would win but was two points out when it came to the correct score. I hope that Martin Edwards is going to be back to defend his title. Sunday had for me a slight tinge of sadness. It was the last day of the conference and it was clear from listening to conversations and talking to people that this was a brilliantly run conference. Like many others I am intending to be back in Bristol next year. The dates for next year are 20-23 May 2010 and Authors already confirmed include - M C Beaton, Natasha Cooper, Colin Dexter, Ariana Franklin and Gyles Brandreth as toastmaster. Also present will be John Curran, author of Agatha Christe and the Mystery of the Secret Notebooks which will be published in September and which will include two previously unpublished Poirot short stories. Thanks to Adrian and Myles for organising such a wonderful conference. Crimefest may be over for this year but next year's convention can't come soon enough! My last post was rather brief and as promised I said I would post again! Seriously though this has been an excellent conference and those of us that get to go to them know that one of the best things about conventions is the camaraderie that is part and parcel of it. Think late nights, sometimes getting up late in the morning and generally hanging out in the bar. This time around I have been rather good, so I think anyway. On Thursday I managed to get to bed at 11:30pm, on Friday I got to bed at 2:00pm and Saturday evening/ Sunday morning is still ongoing. I am not sure whether or not I will get to bed before 4:00am. I am going to be shattered tomorrow if I don't go to bed soon. At the Gala Dinner the Toastmistress Meg Gardiner had the lovely job of introducing the featured guests of honour all of whom spoke briefly and all of whom received a small gift. Amongst those on my table were Lizzie Hayes who runs the group Mystery Women, Maureen Carter, Mary Ann Clarke and Linda Regan all who have books published by Creme de La Crime, Sarah Rayne and Michael Walters who rights police procedurals set in Mongolia. The dinner did not in fact last too long and as can be expected we all converged on the bar immediately. I even managed to find the time to persuade Ali that he should post on twitter the fact that the blog has been updated. I spent most of the evening talking to Zoe Sharp and then later to Kevin Wignall and then Zoe Sharp's ever charming husband Andy. I also got the opportunity to have a quick talk to quite a number of crime writers before they all started wander in off to bed. I finally left the bar at 3:15am in the morning. Tomorrow's panel's look quite interesting! I am not sure at this stage that I am going to make the first panel in the morning I will try but I am not holding out to much hope. I do know however that I will be putting a post on line pretty soon. There is only half a day left. Let me start by saying that this is going to be a very brief post and I will post a lot more later. The interview between Michael Connelly and Peter Gutteridge was excellent. 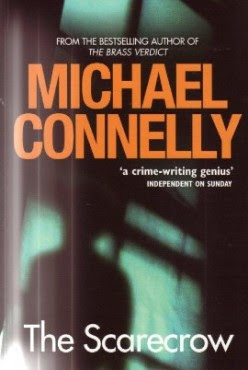 It was wide ranging and Michael covered topics ranging from why he decided to bring back Jack McEvoy, what he is working on at the moment, Harry Bosch to the fact that when Blood Work was made into a film it brought him a whole new readership and the various attempts that have been made to film his books. I have to admit that I enjoy hearing Michael talk and despite the fact that I had just been interviewing him with my fellow Shots colleagues Mike Stotter and Ali Karim, I made sure that I was in the room to listen to him talk to Peter Gutteridge. This evening at the Gala Dinner I ended up wearing the purple dress which went down very well indeed. I haven't received so many compliments in ages. It does wonders ! Three awards were given out this evening. The first award was The Last Laugh Award and the winner was Christoher Fowler for The Victoria Vanishes. The other nominees were Gilbert Adair for And Then There Was None, Christopher Brookmyre for A Snowball in Hell, Colin Cotteril for Anarchy and Old Dogs, Mike Ripley for Angels Unaware and Donald Westlake for Don't Ask. The second award that was given out was the Audible Sounds of Crime Awards. The winner for the Best Abridged Crime Audio was tied. It was split between Stieg Larsson for The Girl with the Dragon Tattoo and Ian Rankin's Doors Open. The winner of the Best Unabridged Crime Audiobook was Kate Atkinson's When Will There Be Good News. I will post more later but have to dash as I am due down in the bar! The fact that I am already posting about day 3 of Crimefest is in itself a feat. Normally I end up posting the following day. This time around I have some free time before I hot foot it to the Michael Connelly interview so I thought that I would use the opportunity to post. Today (i.e. Saturday 16 May) due to the fact that I had a late breakfast and also because I somehow found myself helping out on the Registration table, I managed to miss the first two panels. The first one was Criss Cross: Conan Doyle & Poe Anniversary Panel Past & Present and the second was Hakan Nesser being interviewed by Ann Cleeves. It was a shame that I missed the first two panels but I am certain that I would have been in a worst state of mind if I hadn't had any breakfast. Luckily for me my breakfast companions were the delightful Zoe Sharp and her husband Andy. I did manage to get to the third panel of the day which was Simon Brett who is one of the featured guest's being interviewed by Gyles Brandreth. It was in my opinion one of the best interviews that I have sat through. As serious as the interview was there was a lot of humour and a lot of laughter. Part of the reason for this was because Simon Brett and Gyles Brandreth are old friends and it certainly came through with the quips flowing back and forth from the two of them. I also managed to attend part of the interview between the CWA 2009 Cartier Diamond Dagger recipient Andrew Taylor and Peter Gutteridge. I say part, because I found myself agreeing to do a Shots joint interview along with Ali Karim and Mike Stotter with Michael Connelly. I slipped out of the interview when I realised that I had left my books that I needed to get signed in my room and as luck would have it as I was just going to go back to sit in on the rest of the interview I bumped into the delightful Gaby Young from Orion Publishers along with Michael Connelly. It was really nice to meet Michael again and for me what was even more welcoming was the fact since I have met Michael a number of times now he knows who I am. I was going to wait until Michael had done his event before asking him to sign my books but he immediately asked me if I wanted them signed and proceeded to sign them there and then. He is such a lovely person! After I managed to extract Ali from the interview with Andrew Taylor we met Michael Connelly and Gaby Young downstairs in the Club Lounge where we were subsequently joined by Mike Stotter. The interview was a leisurely one and mainly done by Ali Karim. So watch out on the Shots website for when the interview is posted. Of course , those of you that twitter along with Ali will have seen his twitter about Michael's arrival at Bristol. This evening I have the Constable and Robinson Author Party to attend followed by the Gala Dinner where the winners of the Last Laugh Award and the Audible Sounds of Crime Awards are going to be announced. As to the decision about which dress I am going to wear, I still haven't made up my mind. What I do know is that this may be another late night! I fully intended to post last night, but the spirit was willing but the mind was certainly not. This is what will happen to you when you decide to roll into bed around 2:00am in the morning. Anyway, day 2 of Crimefest was certainly very enjoyable from my point of view. One of the things that I have learnt over the years is that always make sure that you have a good breakfast because you never know here your next meal is going to come from. My day started when I went down for breakfast and joined Ali Karim and Mike Stotter. It is always nice to spend time with both of them and those of you that know Ali know how enthusiastic he is. My first chore of the day was trying to work out which panel to attend. This is always fraught with danger as there will no doubt be at some stage two panels that you would like to go to at the same time. At least this year it was only two track and not three. The first panel that I managed to attend was Foreign Correspondent: Books in Translation. The panel members were Don Bartlett who is best known for translating the Jo Nesbo novels and those of KO Dahl, Reg Keeland (aka Steven T Murray) who has translated such authors as Henning Mankell, Karen Alvtegen and Camilla Lackberg. He is however best known for translating the bestselling novels of Stieg Larsson's Millennium Trilogy. Tiina Nunnally whom one can say started the ball rolling with books in translation when she translated Peter Hoeg's best selling novel Similla's Sense of Snow under the name Felicity David. One of the things that Tiina Nunnally revealed was that as much as she enjoyed the book she herself was puzzled by the ending. 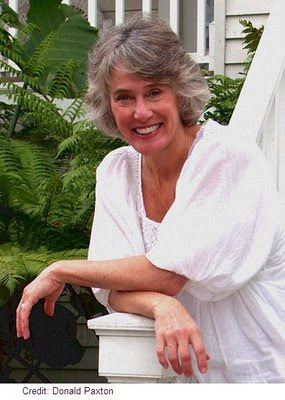 Ros Schwartz who co-translated the 2008 CWA International Dagger Award winning novel Lorraine Connection by Dominique Manotti. Given the state of publishing today it was not surprising to learn that some European translators especially in Scandinavian work in much better conditions than those in some other countries. There was a lively discussion on various topics which included how they decided what books to take on, who had the final say when it came to the translations and how they went about doing the translations i.e. did they read the books the whole way through first of all or did they just jump in and start translating. The second panel that I attended was Crack-up: Lighter than Noir and with Simon Brett as the participating moderator is was always bound to be an interesting panel. The panel members were Ruth Dudley Edwards, Kaye C Hill and Hakan Nesser. Unfortunately Bill James has had to withdraw from the conference due to a family problem. However, his place was ably taken by L C Tyler whose debut novel The Herring Seller's Apprentice was one of my favourite books last year. One of the panels that I was very much looking forward to was the one where John Harvey and Bill James were due to be interviewed by Paul Johnston. Since Bill James was unable to be at the conference this week end Paul Johnston ended up interviewing John Harvey by himself. It was a good interview and John started off the interview by talking about how much he enjoyed Bill James's books. John Harvey has been writing for such a long time and he is best known for his excellent Resnick and Frank Elder series. His latest novel is Far Cry and it marks the publication of his 100th book. The final panel that I attended on Friday was another interview. This time the Toastmistress Meg Gardiner was interviewed by Zoe Sharp who is the author of the excellent Charlie Fox series. Meg Gardiner novel China Lake recently won the 2008 Edgar Award for Best Paperback novel and her first novel in her new series featuring Jo Beckett a San Francisco forensic psychiatrist won the Romantic Times Reviewers Choice Award for Best Procedural Novel of 2008. It was a laid back and funny interview with Zoe Sharp covering a wide range of topics including my favourite the time when Meg as a young girl went along for a Citizen on Patrol trip with her local police and found herself in the middle of a possible hold-up! Creme De La Crime which is an independent publisher of crime fiction also hosted a drinks party to celebrate the launch of their anthology Criminal Tendencies. It is a great collection of Short stories for a great cause - National Hereditary Breast Cancer Helpline with a portion of the price gong towards it. Dinner again was a lively affair as I ended up going for dinner with the Special Guest Maxim Jakubowski and his lovely wife, Peter Gutteridge and of course Ali Karim and Mike Stotter. It was very relaxed, very funny and I can only say that Ali never ceases to amaze me. After a leisurely dinner along the Bristol Harbour we all wandered back to the hotel where we proceeded to spend the evening at the bar chatting and meeting up with old friends. Since I did not manage to post this yesterday, I am now running late and have to go off, have some breakfast and make my way down to the panel's. I am not sure which one I am going to go to first of all but I do know that I am going to enjoy myself again today. This evening Constable and Robinson are hosting their author's party prior to the Gala Dinner. I am still not sure what I am going to wear. Is it going to be the black dress or the purple one? I'll let you know tomorrow! Crimefest 2009 has started (well it started yesterday) and it is shaping up to be an excellent festival. Unfortunately due to the vagaries of my travel arrangements I could not attend the first two panels. However, for information about what happened Peter Rozovsky's site Detectives Beyond Borders has a good rundown on the first two panels. I did manage to get to the third panel which was The Lost Weekend: Eric Ambler and Who? -- Forgotten Authors. It was infact a very good panel and it was interesting to hear what authors the panelists would bring back if they had the opportunity. The panelists were Barry Forshaw the editor of British Crime Writing: An Encyclopedia whose choices were Francis Clifford, Eric Ambler, Alan Williams and to my joy Modesty Blaise creator Peter O'Donnell. Mary Clarke whose chose Ethel Lina White, Declan Hughes who chose husband and wife team Ross MacDonald and Margaret Millar, Sarah Rayne who chose Francis Iles and Christianna Brand. Martin Edwards the participating moderator chose Michael Gilbert and Julian Symons who wrote amongst other things the excellent reference book Bloody Murder. All the panel members mentioned the fact that humour and very good prose were essential. The questions that were asked afterwards were also very insightful and one question in particular sparked off a lively debate on nostalgia. This panel was one that all of us in attendance could have talked about for a very long time. However, the next thing that was the order of the day was the pub quiz. I initially did not have any intention of participating in the quiz but got persuaded by Thalia Proctor to do so. Whilst the questions were at times rather esoteric it was a fun quiz. The team that I was on included recent Edgar Award winner Meg Gardiner, Simon Brett, Zoe Sharp and her husband Andy along with Thalia. We managed to come a credible joint fourth. Of course attend such events as Crimefest means that I can catch up with various people that I hadn't seen in ages. Aside from Ali Karim and my erstwhile editor Mike Stotter, it was also nice to see Lizzie Hayes of Mystery Women, Adrian Magson, Paul Johnston, Ruth Dudley Edwards, Donna Moore, Steve Mosby and L C Tyler amongst ever. Since Friday was the first night I did not stay up late and was tucked in bed by 11:30pm. However today is Saturday and there is still lots to do! Nevada Barr, author of recent New York Times bestseller Borderline, has moved her long-running, award winning series to Minotaur Books. In a deal negotiated by Executive Editor Keith Kahla of St. Martin’s Press and Minotaur Books Publisher Andrew Martin, Minotaur Books will publish the next three books featuring National Park Service law enforcement officer Anna Pigeon starting in 2010. The deal for North American rights was negotiated with Barr’s longtime agent Dominick Abel. Minotaur Books is an imprint of St. Martin’s Press, a subsidiary of Macmillan. The Macavity Award nominations for books published in 2008 and voted on by members of Mystery Readers International have been announced. Congratulations to all the nominees. The awards will be presented in October at Bouchercon in Indianapolis. On Saturday 2nd May 2009 the Malice Domestic Agatha Awards were given out. Congratulations to all the nominee's and winners. Congratulations especially to Canadian author Louise Penny who is two for two on her nominations and wins. Once again congratulations to all the winners. Whilst New York was pre-occupied with Edgar week, on Tuesday 28 April The Crime Writers Association was bestowing its most prestigious award on one of its best known and respected crime writers. The 2009 Cartier Diamond Dagger Award was presented to British author Andrew Taylor by Arnaud Bamberger the Managing Director of Cartier. The Award ceremony was held in the boutique hotel The Gore Hotel in Kensington. Andrew Taylor is the best-selling author of the Richard-and-Judy choice The American Boy and the highly-acclaimed Bleeding Heart Square, which was shortlisted for the 2008 Ellis Peters Historical Award. 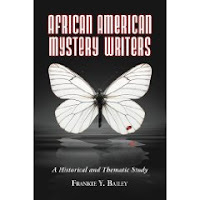 He is also the only crime-writer to have won the Ellis Peters Historical Dagger twice. First for The Office of the Dead in 2001 and again in 2003 for The American Boy. His first novel Caroline Miniscule won the John Creasey Award in 1982. Andrew Taylor has been short-listed for numerous awards here in the UK and abroad including the Gold Dagger and the Edgar Award. Amongst those present at the ceremony were a number of fellow Cartier Award Winners – Colin Dexter, H (arry )R.F Keating, Margaret Yorke and Peter Lovesey. It was a delight to see them especially Colin Dexter and Harry Keating both whom I hadn’t seen for some time. The ceremony was started by the out going Chair of the CWA Lesley Horton who introduced the incoming Chair Margaret Murphy. After handing over to Mr Bamberger who gave his usual speech about “super-sleuths” and the long-standing and continuing relationship that Cartier had with the CWA and the Diamond Dagger Award it was Andrew’s turn in the spotlight and after being toasted to celebrate the Award he delighted all of us present by starting his response to Mr Bamberger’s speech in French. The recipient of the Cartier Diamond Dagger Award is chosen by the members and committee of the CWA and is very much an honour awarded by the author's peers and thus makes it special. It was widely acknowledged that Andrew Taylor was a worthy recipient of the Cartier Diamond Dagger Award this year. His books are widely read especially the Roth Trilogy, the Lydmouth Series and of course The American Boy which propelled him to a wider readership as a result of it being included in a Richard and Judy selection. Also present at the ceremony were my fellow reviewers Ali Karim whose report can be found at the rapsheet, Mike Stotter, Editor of Shots, Adrian Muller and Myles Alfrey the co-hosts of Crimefest and a large number of fellow crime writers including Natasha Cooper, Philip Gooden, Robert Richardson, Lindsey Davies (former Chairs of the CWA), Priscilla Masters and Laura Wilson to name a few. It was a delightful evening and it was a testament to the high regard that Andrew Taylor is held by his fellow crime writers that there were so many people in attendance. Huge congratulations to Andrew Taylor on his award. It was without a shadow of a doubt well deserved. A full list of all the nominees can be found here. For an insiders view of what took place read Sarah Weinman's report on the Award ceremony. Logan McRae's sleuthing in the Granite City of Aberdeen will continue into the next decade as HarperCollins has signed a new four-book deal with author Stuart MacBride. Deputy publishing director Sarah Hodgson signed the deal with Philip Patterson of Marjacq Scripts. Two of the books will continue the Logan McRae series and the remaining two books are likely to be standalone thrillers. HarperCollins will publish the fifth McRae novel, Blind Eye, next month which MacBride will be promoting on a four-week tour across the UK. The sixth McRae book, already under contract, will follow in 2010. The newly acquired books are projected to be published once a year then from 2011. Hodgson said: "This new deal means that we can make long-term plans for the future growth of his career in a structured and sustainable way." Stuart MacBride was born in Dumbarton near Glasgow but grew up in Aberdeen. After a series of jobs including working off-shore, graphic design, voiceovers for local radio and web design he started to write fiction. His first novel, Cold Granite, was shortlisted for the International Thriller Writers' best debut novel [at Left Coast Crime 2006] and won the Barry Award for the best first novel. Both Cold Granite, and its follow-up, Dying Light, have made the shortlist of the Theakstons Old Peculier Crime Novel of the Year Award. Stuart won the CWA Dagger In the Library Award for a body of work at the CWA Dagger Awards 2007. Dying Light, Broken Skin and Flesh House were all top ten bestsellers. Stuart won Breakthrough Author of the Year at the the ITV3 Crime Thriller Awards in 2008. Stuart lives in north-east Scotland with his wife Fiona, cat Grendel, and a vegetable plot full of weeds.